– A large Tankwell in the stern to load lots of gear, complete with moulded-in indents to hold crates in position. – Lots of attachment points using our Multifit fittings for tying gear to the deck. – A Paddle Rest next to the seat to keep your paddle secure while you handle your fishing rods. – A little platform in front of the seat that you can stand on and cast from (if your balance allows it). Two dedicated surfaces behind the seat, within reaching distance, where flush-mounted Rod Holders are installed. All these models also have Multifits installed close to the rod holders for securing your fishing rods. Grooves on the deck, one on each side just in front of the seat, are where we install aluminium Deck Rails. We mould brass inserts into the grooves to attach the deck rails. These rails can be used for attaching a variety of useful off-the-shelf accessories like fish finders. We also mould brass inserts into the hull, on the right side of the boat, to install an Anchor Trolley. Since these four Angler models are very similar in terms of the features they offer, your decision of which one to buy will be determined by how fast you want to go, how much stuff you want to load and whether you would like to be able to stand up to cast or not. This short summary will help you to decide. The Tsomo Angler is perfect if you don’t need to paddle long distances and/or do not have storage space for a longer boat. Due to its smaller footprint, it doesn’t have the same carrying capacity as the longer boats. If you are a really big guy or want to load a lot of heavy stuff on the boat, rather go for one of the longer models. 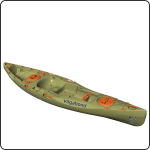 The size of the Tsomo Angler also makes it very suitable for children who want their own Angler sit-on-top kayak. The platform between the seat and footwell is stable enough for smaller paddlers to stand on to cast. The Tarka Angler’s speed and weight carrying capacity makes it very suitable for paddling anglers who want to cover some distance, do some trawling and catch fish without loading a ton of stuff on the boat. It is also great for teenagers and smaller adults who don’t want to deal with a larger boat. The Kasai Angler can carry a lot of weight. If you want to load a lot of gear or intend to catch some big fish and take them home, this boat is the ticket. The boat has good speed too, so it is great for covering longer distances and for trawling too. The platform between the seat and footwell is stable enough for just about anyone to stand on to cast. The Marimba Angler is really about the speed. It has similar carrying capacity to the Kasai Angler, but it is faster. The platform is not as stable for standing as that of the Kasai Angler. If standing up is important to you, rather go for the Kasai. The Marima Angler is a great trawling kayak. If trawling is your main priority, this is the boat for you. Also, if you want one boat that you can use for fishing as well as fitness training, choose the Marimba Angler.